The long-awaited Gran Turismo 5 isn't even on shelves, but developer Polyphony Digital has already started work on its sequel. Gran Turismo 5 isn't quite on the level of Duke Nukem Forever when it comes to eternally-delayed, highly-anticipated sequels, but it's close. At this past E3 2010, the racing sim was finally given a concrete release date - a concrete release date which turned out to be not so concrete after all. Earlier this week, we learned that the long-awaited racer had gone gold at last and that the discs were being printed that very instant. The news that they might be sitting behind the wheel by the holidays thrilled PS3 owners, but Polyphony isn't content with just resting on its laurels for now - the developer has already started work on the inevitable sequel. When asked by Autoweek if the classic 1969 Chevy Camero would make it into Gran Turismo 6 (as opposed to the game they'd just completed), Polyphony Digital boss Kazunori Yamauchi confirmed that it would - and that development on the game was already under route. "It's not something that we can talk that lightly on," said Yamauchi. "It took 2,000 days to get all the ideas that went into GT5. It's just too early to be talking about GT6." According to Yamauchi, the reason for Gran Turismo 5's many delays was to "adjust it so it would be perfect." 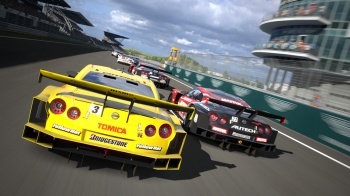 Gran Turismo 5 is expected to see release by the end of the year. We can look forward to Gran Turismo 6 sometime in 2015, shortly after the release of Diablo III and Half-Life 2: Episode 3.